I started this blog on the first day of spring. But like my garden, it hasn't bloomed much. I've decided that I'm going to take a new approach. Everyday I think of gardening and tech stuff, but I don't share it with you all. Today that stops! I'm going to write, small or large and let you be the judge. Welcome to the Bytes and Buds reboot! If you are interested in enjoying the comic that helped to inspire this post you can purchase Try Rebooting Yourself from Amazon. 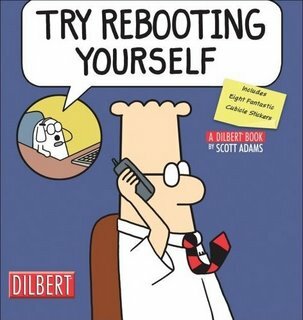 You can also view comics from Scott Adams daily on Dilbert.com. Welcome and Happy Spring Equinox! Happy Spring Vernal Equinox also known as the first day of spring! I am happy to welcome you to my little space of opinion on gardening and technology! My name is Galanda and I came to love gardening in my "middle age" season. My grandparents and mother were avid lovers of all things garden and plants, but I couldn't stand to get my hands dirty. I loved the look of plants and flowers, but didn't want to put in the work. Sometime soon after I purchased my first home the gardening bug hit me. The first few years it was just flowers. After learning more about what was in and being done to our food supply, gardening for veggies became the natural progression. Now, I'm committed to sharing what I know and learn that can help everyone have the joy and benefits and gardening in their lives. On the "bytes" side, I have worked in technology for several years. What I've found is that the great tools that are readily available and that can help people with their every day lives are not well known. I hope to share some of those tips and tricks to help your lives just a little bit easier. I also will share info regarding tech jobs and generally cool stuff from time to time. I have to admit that I am "team Android," but plan to make an effort to share tools for folks in the Apple world as well. I live in a split household as my hubby is everything Apple (iPhone, iPad, iMac) and I have Windows on my laptop and Android on my mobile devices (phone and tablet). What I find to get him tightened up, I'll share with you all too! I look forward to sharing these experiences and knowledge with all of you. Due to the season, you will see more gardening post as we gear up for growing, but stay tuned in as some of those tech tips will help as well.